Judges John F. Scileppi, Francis Bergan, and James Gibson would reach the constitutional age limit of 70 years at the end of the year. 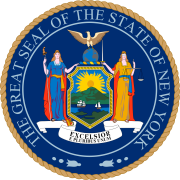 The 1972 New York state election was held on November 7, 1972, to elect three judges of the New York Court of Appeals, as well as all members of the New York State Assembly and the New York State Senate. Despite efforts by Governor Nelson A. Rockefeller and others, no woman was designated by any party for the Court of Appeals. Family Judge Nanette Dembitz was fourth placed in the vote of the Democratic State Committee, and challenged the party designees. The Democratic State Committee met on April 3, and designated Appellate Justices Lawrence H. Cooke and M. Henry Martuscello; and Supreme Court Justice Bernard S. Meyer for the Court of Appeals. On April 14, Family Court Judge Nanette Dembitz announced her challenge to the designees,. and a primary was held on June 20. The Republican State Committee met on April 3 at Albany, New York, and designated Appellate Justice Dominick L. Gabrielli, Supreme Court Justice Sol Wachler and lawyer Hugh R. Jones, President of the New York State Bar Association, for the Court of Appeals.